This mosaic from NASA's Dawn spacecraft shows dark material near a series of craters known as the "snowman" on Vesta. That ejected material is a complex mixture of components. 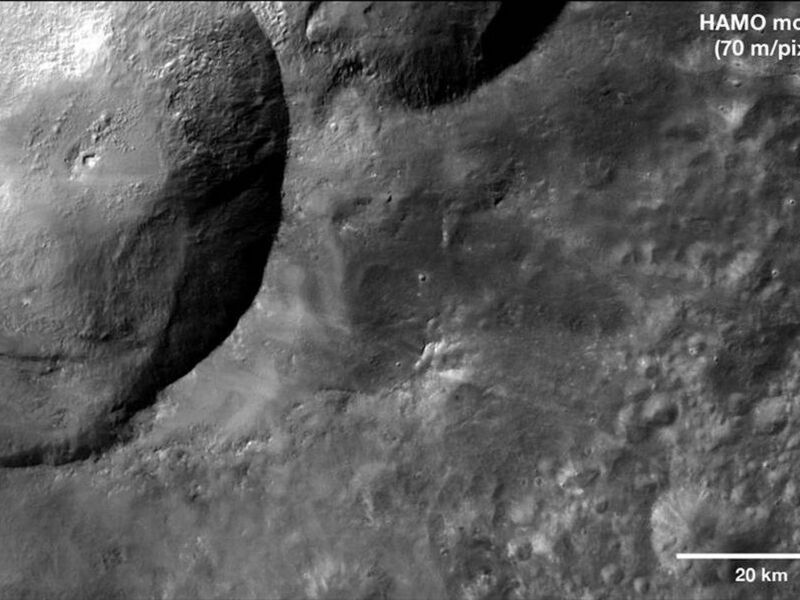 They likely include both dark material thrown out from the craters during the impacts that created them (ejecta), and darker melt that occurred during the impact. 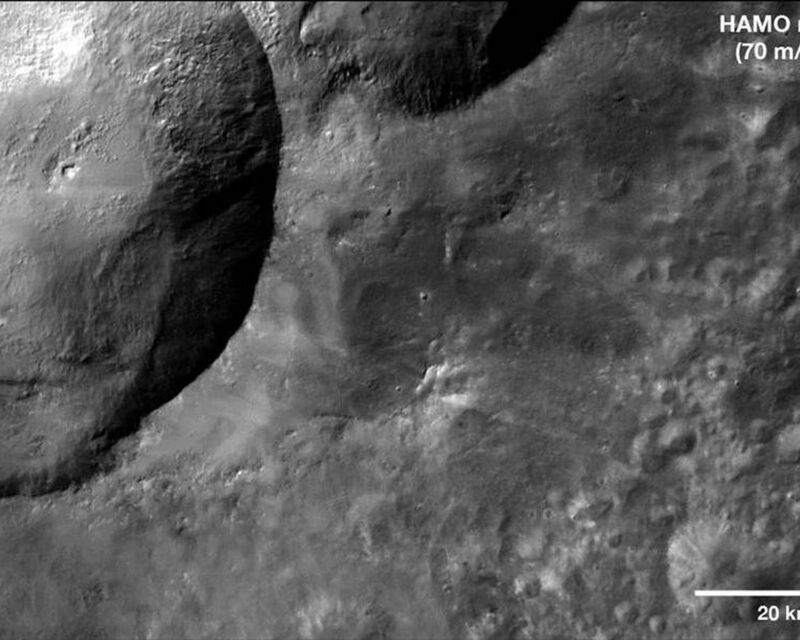 An annotated version of the image highlights the patches of dark material. The images that make up the mosaic were obtained during high-altitude mapping orbit (on average 420 miles or 680 kilometers above the surface). The mosaic covers an area of about 3,000 square miles (7,500 square kilometers). It is a close up of the southeastern parts of Marcia and Calpurnia craters, the two craters that make up the lower part of the "snowman." For a wider perspective of this area taken during Dawn's survey orbit (on average 1,700 miles or 2,700 kilometers above the surface), see https://photojournal.jpl.nasa.gov/catalog/PIA14673 . 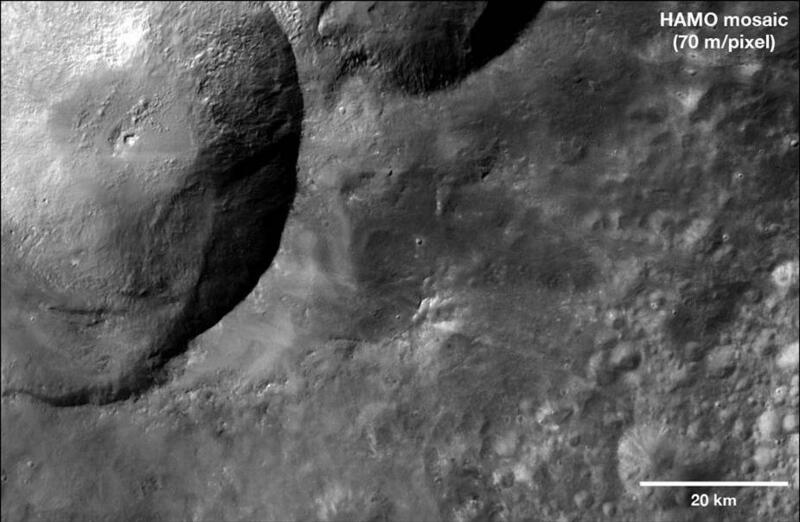 The images were obtained from Oct. 11 to 16, 2011. The Dawn mission to the asteroids Vesta and Ceres is managed by NASA's Jet Propulsion Laboratory, a division of the California Institute of Technology in Pasadena, for NASA's Science Mission Directorate, Washington. Dawn is a project of the directorate's Discovery Program, managed by NASA's Marshall Space Flight Center in Huntsville, Ala. UCLA is responsible for overall Dawn mission science. 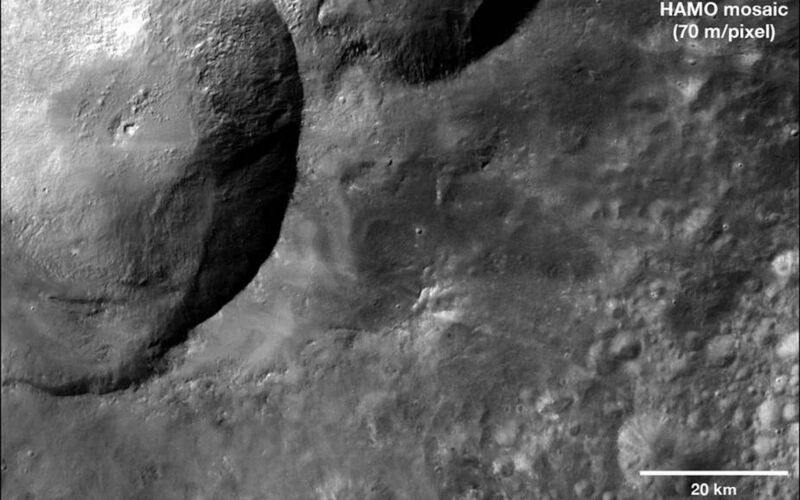 The Dawn Framing Cameras have been developed and built under the leadership of the Max Planck Institute for Solar System Research, Katlenburg-Lindau, Germany, with significant contributions by DLR German Aerospace Center, Institute ofPlanetary Research, Berlin, and in coordination with the Institute of Computer and Communication Network Engineering, Braunschweig. The framing camera project is funded by the Max Planck Society, DLR, and NASA/JPL.